Baghdad, Kandahar, Jakarta—not to mention Dresden, Hiroshima, Hanoi: the mass killing of civilians as collateral damage, especially as the result of air bombardment, represents one of the most emotional and ethically urgent issues in the contemporary world. Many experts in the field see the civil war that tore apart Spain as the original site of this “new kind of war,” as George Steer, reporting on the bombing of Guernica, christened it. Your Children Will Be Next centers on the bombing of Getafe, a small town south of Madrid, shortly after that war’s outbreak—when Nationalist rebels advancing on the capital launched air raids on targets that unfortunately included this suburban township, where thirty young children were killed. The claims of the Republican government produced not only the celebrated poster—“If You Tolerate This Your Children Will Be Next”—but also a worldwide propaganda campaign that stimulated support for the Spanish republic. The core of this thought-provoking book is a meticulous account of the alleged atrocity of Getafe that is presented as part of a wide-ranging survey of both sides’ conduct in the matter, as well as the reactions of politicians, soldiers, reporters, writers, and artists. 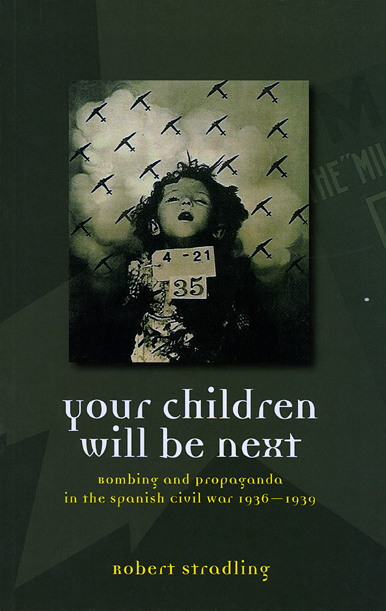 Appealing to anyone with an interest in European history, as well as in the potent powers of media and propaganda, Your Children Will Be Next is guaranteed to stimulate lively debate on a powerful and controversial topic. Chapter 13: Guilty by Authorship? Chapter 14: Gernika—The True Getafe?